Good exposure, better odds By opening yourself up to the temporary job market — including summertime work — you increase your chances of getting a full-time job. Money A little income is better than none and depending on when, where, and how much you work may enable you to still qualify for unemployment benefits, if necessary. Experience A temporary job such as seasonal summer work is a quick way to get some experience in a field in which you’re interested or with a skill that you may be lacking. Try out something new A temporary job allows you to explore a new career direction. You may find you enjoy a line of work you never had even thought of! Flex time Many temporary jobs are part-time, leaving your schedule partly open to continue with your longer-term job search or family commitments. Exploring Options A temporary or part-time job is a great way to learn about a company from the inside, helping you to decide if you would like an opportunity to become a full-time employee. Easier to hire Costing less than full-time employees, part-time employees are appealing to companies in hard times. “Lowering your barrier to entry” means that as a temporary employee you could get hired by a company that couldn’t afford to hire you otherwise. Full-time potential The “temp-to-hire” situation is one in which a company brings in temporary employees to test their skills and filter candidates for full-time hiring. If you’re a good worker, the company may be so happy with your temp results that they offer you a full-time job. So what are you waiting for? 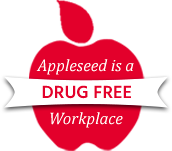 At Appleseed, we have a variety of seasonal and temporary or part-time employment opportunities for individuals of all ages, skill sets, and interests. Summer’s a great time to try something new and earn money while doing it.